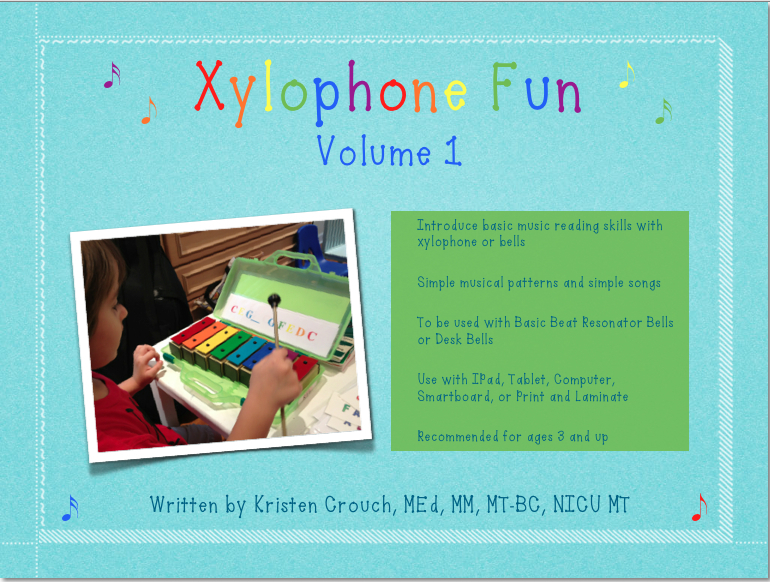 Xylophone Fun eBooks is a curriculum for introducing the basics of music reading through color matching, letter matching, simple patterns, and simple songs. 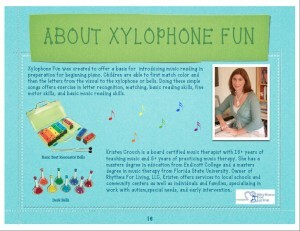 Xylophone Fun was created to offer a basis for introducing music reading in preparation for beginning piano. Children are able to first match color and then the letters from the visual to the xylophone or bells. Doing these simple songs offers exercise in letter recognition, matching, basic reading skills, fine motor skills, and basic music reading skills. Does your child love music? Have you thought about introducing your child to piano? Here is a simple method to introduce your child to basic music reading skills that can be later transferred to learning piano. Research shows that music engages both sides of the brain and is very beneficial in enhancing learning. Xylophone Fun targets motor skills, hand-eye coordination, and cognitive skills such as letter recognition, matching, and patterns. 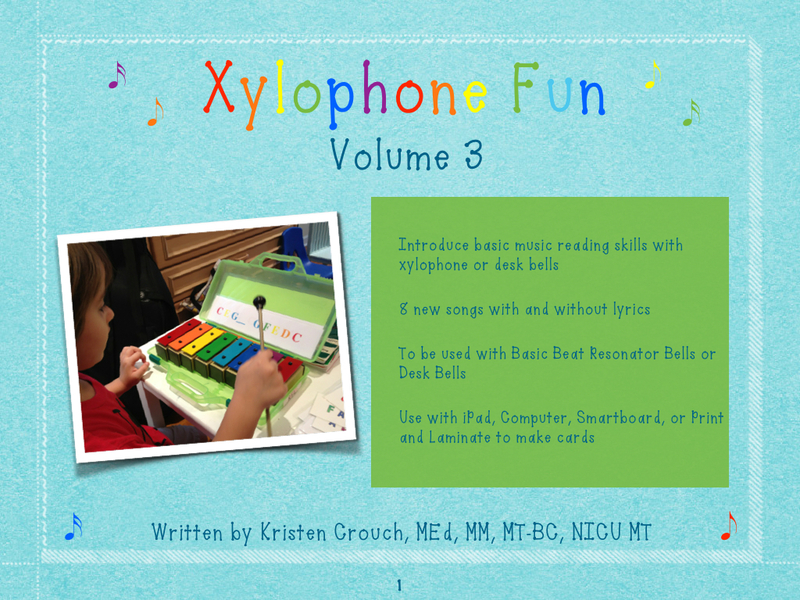 Included in your eBook (PDF file) is a xylophone layout, xylophone visuals, basic music patterns, and three simple songs, as well as hints on how to use the resource. Once your purchase is complete you will be redirected to a purchase page with directions on receiving your eBook. You may need to click on: Return to merchant. Were you not redirected? Contact us! 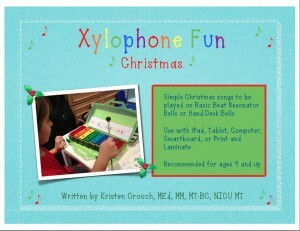 Included in your eBook (PDF file) is a xylophone layout, xylophone visuals, and six songs, as well as hints on how to use the resource. 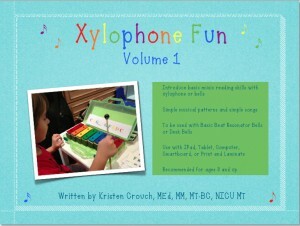 Included in your eBook (PDF file) is a xylophone layout, xylophone visuals, and eight songs, as well as hints on how to use the resource. A holiday collection of Christmas songs to be played on Basic Beat Resonator Bells or Desk Bells. Each song is offered with and without lyrics to encourage singing along. 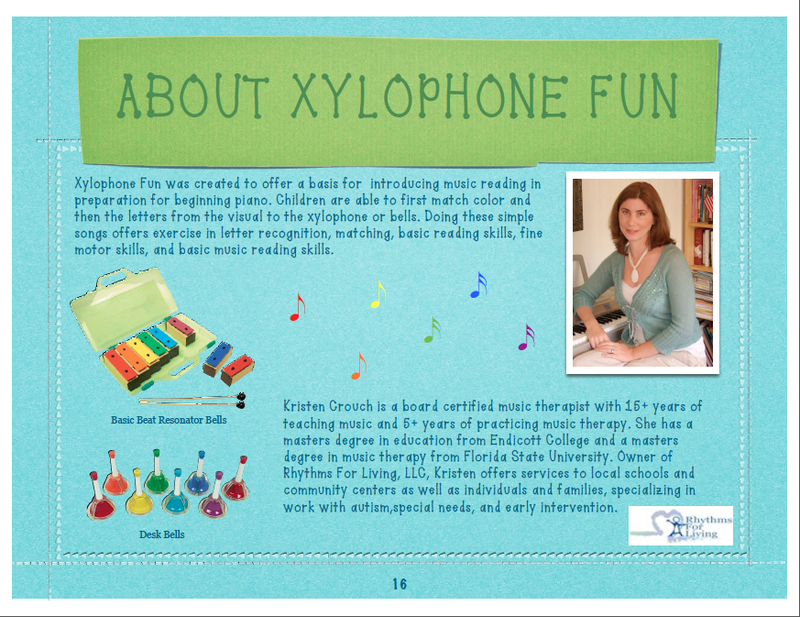 Included in your eBook (PDF file) is a xylophone layout, xylophone visuals, seven simple songs, as well as hints on how to use the resource. Volumes 1, 2, 3, and the Christmas Edition all in one purchase! 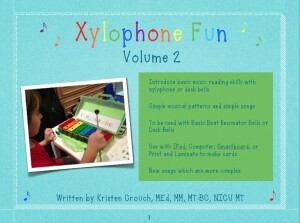 Your purchase of the Xylophone Fun eBook Package will provide you with instant access to all four eBooks described above. Please Note: Once your purchase is complete you will be redirected to a purchase page with directions on receiving your eBook. You may need to click on: Return to merchant. Were you not redirected? Contact us! If you need to purchase a Xylophone or Desk Bell set to go with the Xylophone Fun Curriculum see our links below. Remember, this curriculum only works with these specific instruments, and will not work with any other colored xylophone or bells. You can use it with non-colored or mono-colored xylophone but you will not have the benefits of the matching of colors technique. A mono-colored xylophone (similar to the Orff xylophones) will have letter names which you can match. This curriculum is specifically color coordinated to be used with the Basic Beat Resonator Bells and desk bells. NOTE: For Xylophone Fun you need the Basic Beat 8-note Resonator Bells in the green case. The bars/bells are red, orange, yellow, green, aqua, blue, purple, and red. 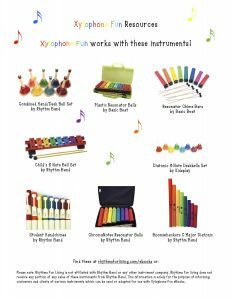 Update: Please see our updated resource page which shows other instruments that can be used with Xylophone Fun Curriculum. visit our Xylophone Fun Resources page. Please note: Rhythms For Living is not affiliated with Rhythm Band or any other instrument company. Rhythms For Living does not receive any portion of any sales of these instruments from Rhythm Band or any other instrument company. 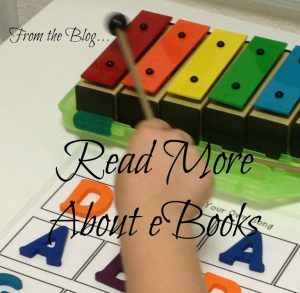 This information is solely for the purpose of informing customers and clients of various instruments which can be used or adapted for use with Xylophone Fun eBooks.